Tile flooring - along with most hard surface flooring options - is a very popular flooring choice right now. Tile has the variety that people want along with easy maintenance and long term durability. There's a lot to like about tile flooring and today's designs take it far beyond the kitchen and bathroom. Before you go shopping for tile flooring, keep these tips in mind from Indianapolis tile flooring store, Kermans. Not all tile works well in all areas of your home. Some are more porous and soft while others are more scratch and water resistant. Some are able to take on the look of many different types of flooring while others offer a more basic range of designs. Take some time to learn about popular types of tile and you'll find the one that's best for you. Tiles are made from natural materials and as such they each have variations. Many people feel those variations are a big part of what makes tile beautiful. You can get a tile floor that has lots of shade variation or a tile floor with a more uniform appearance. One doesn't carry more benefits than the other but it is certainly something to keep in mind as you're looking at tile flooring options. You should also talk to your flooring store about pattern and layout because that can also influence how the tile looks in your particular space. Tile is very easy to maintain and keep clean. Grout is not. If you have seen a tile floor and thought it looked dingy or dirty, chances are it was because of the grout. Kermans highly recommends sealing your grout to resist stains and keep your grout looking like new. When it’s time for regular cleaning, Kermans recommends a concentrated tile and grout cleaner available in our showroom. Tile flooring today comes in a beautiful array of materials and styles. 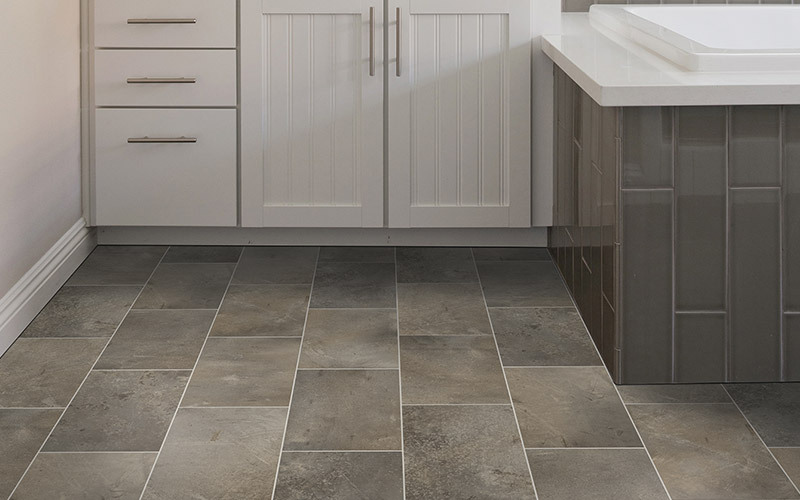 Whether you are looking for tile flooring for your kitchen or bathroom, your entryway or your all-purpose room - or perhaps a backsplash - we have a tile that's just right for you.